Rockstar Energy Racing put the West Coast in the rear view mirror for the time being and began the long trek through to the East. The continuation of the 450 title chase and round 1 of the East Coast 250 Championship kicked off in the massive Dallas Cowboys Stadium. 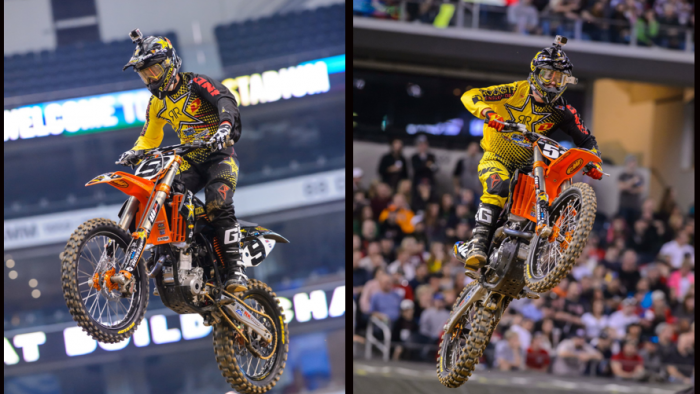 The team was starting the East swing without Davi Millsaps and Joey Savatgy who were both injured during the offseason. In their place Ivan Tedesco will keep riding the KTM 350 in the 450 class and Cole Thompson will be contesting the 250 class. Unfortunately the track in AT&T Stadium left something to be desired with the extreme slickness of the soil. During practice it seemed that there was never a time where there wasn't a yellow flag signifying a crash somewhere on the track. The slippery surface made for very tough passing conditions and the need for a good start that much more imperative. It seemed Ivan Tedesco kept getting hung up in the tight first turn although being on the inside. It was evident in qualifying practice that turn one was the most treacherous with several riders losing their front end and going down. Luckily he was able to get through unscathed every time considering that he had to line up for 3 qualifiers to make his way into the main event. He nabbed the very last qualifying position of the night, thus giving him last gate pick. He definitely got his money's worth for the second time this season as he had to race 4 times in one night. In the main he was forced to start all the way in the farthest outside gate. The strategy was to pause coming out of the gate and dart back inside in an effort to gain as many positions as possible and avoid being punted out onto the concrete. He was successful in not going down but was unable to garner very many positions. Ivan put in his 20 laps and was able to make his way into 12th place on the treacherous surface, his second best finish of the 2014 season. Ivan Tedesco: "It was a little bit of a rough night for me. Practice actually went a little better than normal. I qualified 14th, which I guess is good for me since I've been struggling in practice. In the races I just didn't get the greatest of starts and on this track, starting position was important. I had to ride every race, and go to the LCQ to transfer into the main. Once again got a bad start in the main, tried to ride a good 20 laps but just didn't have it tonight." After taking a stab at the 450 class in a couple West Coast races, Cole Thompson was able to get the bugs out a little bit after not racing for quite some time. He then hopped on the 250 and began testing for the East. After a bad crash as a privateer a year ago in Arlington, Cole wanted to get a good start to the series and come out uninjured and confident heading into round 2. After less than stellar times in qualifying practice, he stepped up his game as racing began, qualifying easily out of his heat race. Even more impressive was his main event. He kept his head together, running a mistake free race and was rewarded with a commendable 6th place finish. Cole Thompson: "Good progress for the first round, made it through healthy and ended up with some good points. I'm looking forward to Atlanta now that I have one under my belt. I need a better start and to be more aggressive throughout the whole race and I should be able to put myself into a better position." The team will now head to Atlanta for Round 2. Tedesco sits only 8 points out of the top ten overall for the season and will look to close that gap. Thompson will aim to improve on his 6th place and finish in the top 5. Davi Millsaps has now started riding and fully intends to return to racing during this Supercross season. Joey Savatgy sees the doctor in a little under two weeks and expects to be released to start riding shortly after. Jason Anderson has already began testing for the outdoor nationals as he puts his 250 SX points lead on the back burner until the return to the West in April at Reliant Stadium in Houston.